Chris Carpenter pitched 8 shutout innings and Albert Pujols homered twice as the St. Louis Cardinals downed the Arizona Diamondbacks 6-1 Friday night at Busch Stadium as the Redbirds opened the second half of the season with a victory. Pujols’ blasts were solo shots in the 4th and 6th innings. Nick Stavinoha homered as well for the Cardinals, belting his round-tripper as he pinch hit for Carpenter in the bottom of the 8th inning. Yadier Molina went 4 for 4 with 4 singles, scoring a run. Skip Schumaker had a 3 for 5 night with a run scored. Miguel Montero spoiled the shutout with a home run off Jason Motte, who came in to pitch the 9th inning. 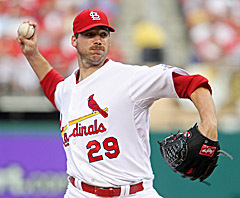 Carpenter (8-3) gave up 7 hits while striking out 7 for the win. D-Backs starter and losing pitcher Jon Garland (5-9) allowed 2 earned runs on 7 hits in 6 innings of work. The Cards host the D-Backs in game 2 of their weekend series Saturday night at Busch. Adam Wainwright puts his 10 and 5 record on the line as he goes to the mound against the Snakes’ Dan Haren (9-5).